Is season 13 of The Voice TV show on NBC still music to your ears? As we all know, the Nielsen ratings typically play a big role in determining whether a TV show like The Voice is cancelled or renewed for a 14th season. Unfortunately, most of us do not live in Nielsen households. Because many viewers feel frustration when their viewing habits and opinions aren’t considered, we’d like to offer you the chance to rate all the season 13 episodes of The Voice for us here. An NBC singing competition series hosted by Carson Daly, The Voice typically airs twice weekly, on Monday and Tuesday nights. In season 13, returning coaches Adam Levine, Blake Shelton, and Miley Cyrus welcome new coach Jennifer Hudson. Team advisors in the 13th season include Joe Jonas (Team Adam), Rascal Flatts (Team Blake), Billy Ray Cyrus (Team Miley), and Kelly Rowland (Team Jennifer). What do you think? Which season 13 episodes of The Voice TV series do you rate as wonderful, terrible, or somewhere between? 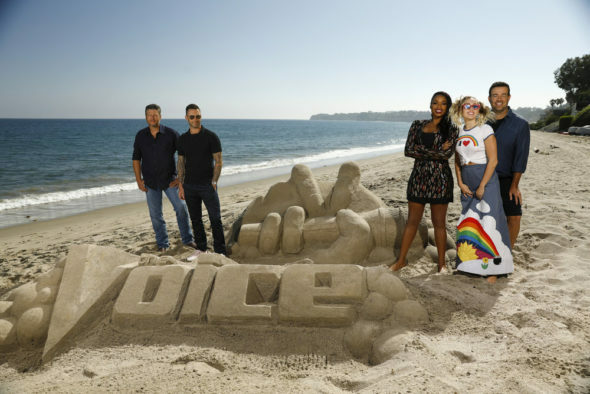 Are you happy NBC renewed The Voice for a 14th season? Don’t forget to vote, and share your thoughts, below. The Voice: Cancelled or Renewed for Season 14 on NBC?